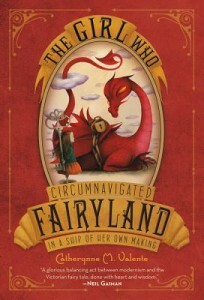 If you can accept a Wyvern (who looks like a dragon but is only a remote cousin) that has a Library as a father, then you will not only be able to read “The Girl Who Circumnavigated Fairyland,” you will get the humor in the above quote. It took me a while, and so I was not sure if I was going to stick with this book or not. “The Girl Who Circumnavigated Fairyland” is definitely an out-of-the-box piece of children’s literature, at times annoying, and at times, brilliant. It seems to have mixed together elements of Alice in Wonderland, The Phantom Tollbooth, Terry Pratchett’s works, and several other classic tales to create a most unusual tale. At times, the black humor of it doesn’t work for me. And yet, there is something compelling about reading the story. This is a complex and sometimes not easily understood children’s book, that weaves multiple themes and threads together. I am not sure what age would appreciate the complexity of this children’s book. In some of the reviews, it is referred to as YA (young adult) literature. I tend to agree, although some young adults (12 and up) might find it too childish to read about Fairyland. That may be so. The other challenge with “The Girl Who Circumnavigated Fairyland” is that ultimately, it makes fairyland appear to be a creation of one’s own mind, and for those that would prefer to hold on to the illusion, the book can feel like a cold bucket of water. So I would not recommend it for any child who still loves to daydream about happily ever after. It’s not that the story doesn’t end well, but it does have the flavor, explicitly, of Persephone or Demeter, who ate the six pomegranate seeds and had to return each season.